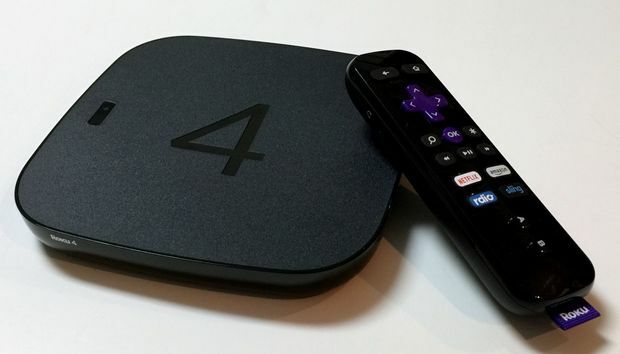 Out of all the products in Roku’s lineup—and there are many—the Roku 4 is the one that doesn’t quite fit. Physically, it’s nearly four times larger than Roku’s other three hockey-puck-shaped players, and it’s the only one that needs an internal cooling fan. And at $130, it’s also the most expensive. These are the compromises Roku had to make to pack in a more powerful processor, which in turn allows the Roku 4 to stream 4K Ultra HD video. With or without the higher-resolution video, the Roku 4 is only a minor improvement over the $100 Roku 3. Its other key selling points—optical audio out, 802.11ac Wi-Fi, a neat remote finder feature—are fine additions, but they don’t alter the core Roku formula. They also don’t help solve any of Roku’s underlying problems, which are starting to become more apparent as more competitive media streamers arrive. The Roku 4 demands much more shelf space than the Roku 3. Give the Roku 4 credit for this: It’s shown a major commitment to 4K content in its first few months on the market. Beyond just Netflix and Amazon Video, 4K apps are available from M-Go, Vudu, Ultraflix, Plex, YouTube, Smithsonian Earth, 500px, and Flickr. No other media streamer offers this deep of a 4K catalog. Roku wants to make sure you’re aware of this. The Roku 4 includes a “4K Spotlight” app, which lists all available 4K apps and links to some of their best content. It’s not as convenient as it should be—from the app, it’s hard to distinguish rentals from downloads, or to figure out how much anything costs—but at least it points you in the right direction. Roku’s 4K Spotlight digs up Ultra HD videos from across different apps. Whether you’ll actually notice all those extra pixels is another matter. As I wrote in my Roku 4 vs. Amazon Fire TV comparison, the difference in picture quality from 1080p full HD to 2160p Ultra HD is subtle at best—and imperceptible at worst. Flipping between resolutions with a variety of content, I’ve struggled to notice the improvement on my 70-inch Vizio 2015 M-Series television. If you own a 4K TV, buying a Roku 4 will largely be about the feeling of getting your money’s worth. The Roku catalog is so extensive because it’s been around the longest, and because the platform offers simple tools for app makers. But over time, these strengths are becoming liabilities. Roku’s ready-made app templates, used by some major services like HBO Go and PBS, are showing their age; those apps on other platforms simply look more polished. While Roku does offer more extensive app-building tools, not all developers are taking advantage. Another concern is Roku’s continued reliance on a basic app launcher, which can feel inefficient when you’re unsure what to watch. Other platforms have come up with creative approaches to this problem: Fire TV scatters Amazon Prime videos all over its home screen and menus, the new Apple TV previews content from your favorite apps as you scroll over them, Android TV has a recommendations bar that any app can feed into, and Chromecast offers a companion app with featured content from across its app catalog. The Roku home screen is all about apps. The closest Roku gets is its “Roku Feed” feature, which lets you flag TV shows, actors, and upcoming movies, and get notified as they arrive on major streaming services. The concept is clever—it’s sort of like a modern-day interpretation of the DVR—but it needs more ways to browse for content and sort through items you’ve already added. Roku feed lets you follow movies and shows, and alerts you as new streaming options become available. When you do know what you want, Roku 4 does offer voice search in its remote control and companion smartphone app, just like the cheaper Roku 3. Searching for a title brings up a list of streaming services where that video is available, and the list of sources Roku taps into—including Netflix, Amazon, Hulu, HBO Go, CBS All Access, Crackle, and Vudu, among others—is more extensive than what rival streaming platforms offer. But in other ways, the execution is weaker. You can only search by actor or title—not by genre—and too often the microphone failed to understand my requests. In some cases, Roku’s pricing and availability results were just wrong. Roku’s voice search cuts across more than 20 video sources. In lieu of any software changes, the decision to buy a Roku 4 rests entirely with the hardware. And while it’s usually a good idea to get the best box you can afford, that’s not necessarily the case with the Roku 4. Chances are, you don’t need the Roku 4 if you don’t have a 4K TV (and maybe even if you do). The $99 Roku 3 feels nearly as fast because the menu system runs in 720p instead of 1080p. The Roku 4’s 802.11ac Wi-Fi support might be helpful if the device is going to be far away from your router, or if your airwaves are crowded with other devices; otherwise the Roku 3’s 802.11n connection should be sufficient. Optical audio output is only necessary for connecting with external sound systems if your TV doesn’t pass its audio through (using HDMI's Audio Return Channel, or ARC). The Roku 4 is the company’s first player with an optical audio output. Even the Roku 4’s remote is nearly the same as that of the Roku 3, except that you can now press a button on the box to sound a tone on the remote. It’s a clever touch, but the remote is chunky enough that it probably won’t get lost between the cushions too often. (The 2015 Apple TV, which is seems to be optimized for disappearing into the couch, desperately needs this feature.) Meanwhile, Roku hasn’t bothered to add any TV volume or power-off controls to its remote, which means you’ll need to keep a separate remote handy at all times. None of this is to say that Roku as a whole isn’t a worthy streaming-video platform. While some aspects of the software are in dire need of upkeep, for now its app selection and simplicity are easy to recommend, especially if you’re not bound to the platforms of Apple, Amazon, or Google. But unless you’re looking to justify a 4K TV purchase, Roku’s flagship box isn’t for you. Go with the cheaper, smaller Roku 3 instead.